There was a time not too many years ago when new golf courses were sprouting up all over the region, public and private. I can recall writing round-up stories in the Philadelphia Inquirer about the half-dozen or so courses that would be in various stages of planning, construction or their first year of operation. How many courses have opened in 2010? One. That course is Applecross CC in Downingtown, sister course to Talamore CC in Ambler, which the owners, the Talamore Group, are promoting as a 2-for-1 membership. "If there is a better deal in town, I’d like to know what it is," said Jon Hazelwood, general manager of both clubs. Given the laws of supply and demand, Applecross, which opened July 1, could be it the last new course in the area for a while. Hazelwood goes even further, bluntly predicting, "Applecross will probably be the last new golf course built in the state of Pennsylvania. There is no reason for there to be another one, unless the game of golf grows." Good point. Rather than grand openings, the talk in most grill rooms these days are rumors about what courses and clubs are barely hanging on or facing mergers or outright closure. Why, then, did the Talamore Group, open Applecross? Because he thought he could make a go of it even in the down golf economy. "The courses complement one another – the courses and the distance between them," said Hazelwood. "Applecross was a great product to add to the products we already had. But to think it’s not going to be a grind is very naive." In 2005, when Applecross CC was first envisioned as the centerpiece of an upscale residential development by the Pulte Group, the Talamore Group wanted to develop the country club component. It lost out to ClubCorp, at the time a big privately-held Dallas-based club management company. In 2006, ClubCorp sold off everything except the Pinehurst Resort to private-held equity firm, KSL Capital Parnters. "Well, apparently Applecross wasn’t a good fit for KSL," said Hazelwood. In 2009, the Talamore Group was back in the picture. Any regrets, considering the downturn? "No," said Hazelwood. "Once we got involved, it was full steam ahead. If you’re not going to go full steam ahead, then don’t get involved." So far, said Hazelwood, the toughest part of marketing Applecross and Talamore is getting potential members to appreciate and understand the 2-for-1 membership – 4-for-1, if you include two more sister courses in Pinehurst, Talamore Resort and the Mid South Club. "The concept of multi-club memberships is very new to this area," said Hazelwood. "You have Philly Cricket with two courses, but I don’t know of anybody else who has two different facilities." A Tier 1 full golf membership is a $12,500 refundable deposit with various incentive plans; annual dues are $2,995. Like most clubs in the area, those numbers are down from years past ($4,200 in 2009, $5,200 in 2008). So far, Applecross has about 115 full golf members and another 200 or so social members. Talamore has 300 golf members. The goal is for each to have 350 full golf members. "We’re getting there," said Hazelwood. "We’re continuing to grow, weathering the storm. I can tell you that in the times we are in, it could be worse." Acer3x, I haven’t played LuLu but I can tell you that Applecross is better than Plymouth. I played Applecross. It was in very good condition. Nice layout, except for a couple of weird holes (10th and 14th). The courses are too far away from each other. Talamore should have bought LuLu or Plymouth. Word just in from Golf Channel that the network is launching a morning show, beginning in January. 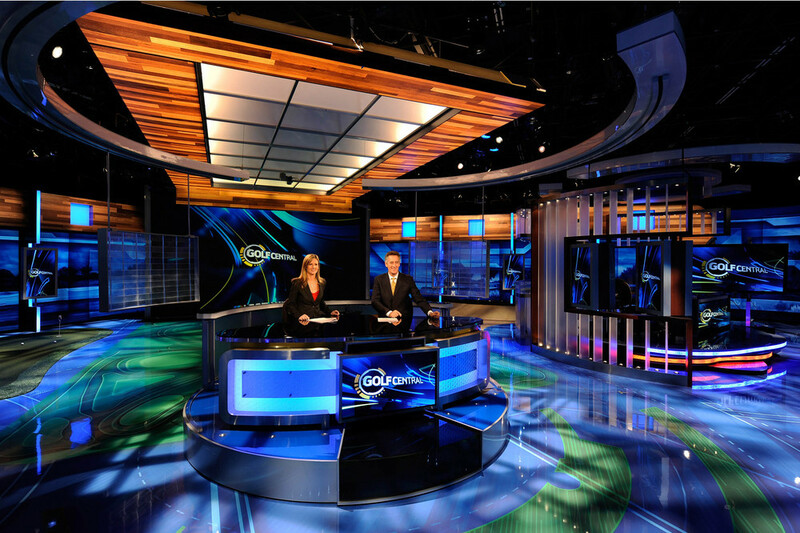 ORLANDO, Fla. (Sept. 15, 2010) – Golf Channel announced today that it has greenlit the network’s first-ever morning show. Tentatively titled Dawn Patrol and currently in development, the show is slated to debut in January 2011. Scheduled to air live, weekdays from 7-9 a.m. ET from Golf Channel’s Orlando, Fla., studios, the show will feature news and commentary on the biggest sports and news stories of the day. Following a news/talk show format, the sports-driven morning show will place an emphasis on golf while also offering a fresh perspective on topical news, sports and pop culture. The program will feature field reporting and an array of in-studio guest appearances from a variety of industries. Golf Channel currently is searching nationwide to cast the program’s two co-hosts. "We’ve wanted to introduce a morning show to Golf Channel for a number of years and felt that now was the right time," said Tom Stathakes, Golf Channel senior vice president of programming, production and operations. "Tackling everything from Tiger Woods to Brett Favre, the show’s format will be unlike anything we’ve done before and we are very excited to be launching it in 2011." Is there an argument to be made that Sean O’Hair got snubbed by Corey Pavin by not being one of his four captain’s picks? Despite winning $1.8 million so far, 2010 has been a so-so year for O’Hair, the West Chester resident. He hasn’t won, he has only three Top 10 finishes and, barring a huge week at the BMW Championship in Chicago, he’ll likely be done for the season. For anyone who notes that Captain Pavin had to skip over O’Hair, at 18th in Ryder Cup points, to get to rookie sensation Rickie Fowler, 20th in points, don’t forget that Fowler has racked up those points in only one year. 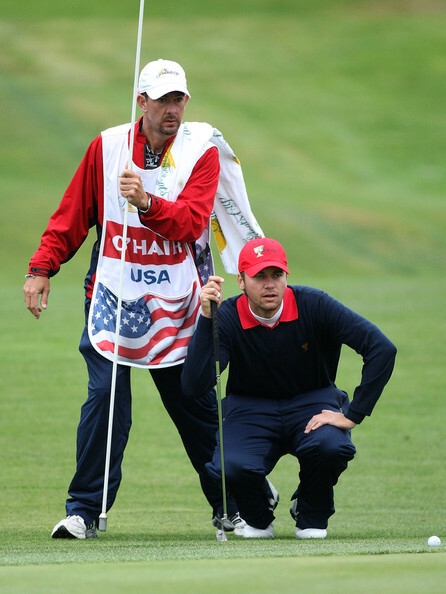 Coming off his strong performance in the 2009 Presidents Cup, where he went 2-2-1, it is fair to argue that O’Hair would have brought something of a veteran’s perspective to a team that already included three first-timers (Matt Kuchar, Bubba Watson and Jeff Overton). Still, it’s hard to complain about Pavin’s picks: Tiger Woods, who is still No. 1 in the world appearing to be getting back on track; Ryder Cup veterans Zach Johnson (11th in points, Ryder Cup record 1-2-1) Stewart Cink (14th in points, Ryder Cup record 4-7-4) and Fowler, the hottest rookie on the PGA Tour. Fact is, O’Hair was in the conversation for the U.S. Ryder Cup team – he was mentioned prominently in all speculative stories -- but he needed to turn some heads coming down the homestretch, which he didn’t to. For fans of Pine Valley Golf Club, circle Sunday, Sept. 12 on your calendar. That’s the day of the finals of the 86th Crump Cup. The George Arthur Crump Cup Memorial Tournament, named for the founder and main architect of the club, is a four-day competition among a field of top amateurs. 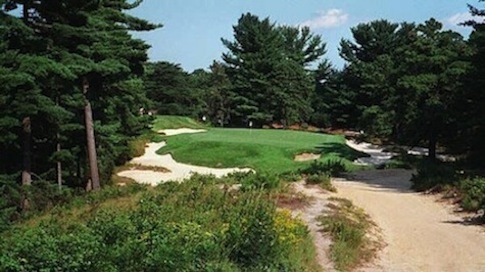 The day of the finals is the one day of the year that Pine Valley, near Clementon, N.J., the No. 1 ranked course in the country, throws open its doors to any and all comers. Here is the pertinent information for this year’s Crump Cup. -- Doors open at 1 p.m., Sept. 12. -- Parking is $20 per car, which will include a shuttle bus ride to the course. -- The Clementon Youth Athletic Association will set up a refreshment stand inside the front gate. -- Video, photographs and cell phones are not permitted. Do not bring cameras. -- In case of inclement weather, call 856-783-3000, Option 4. 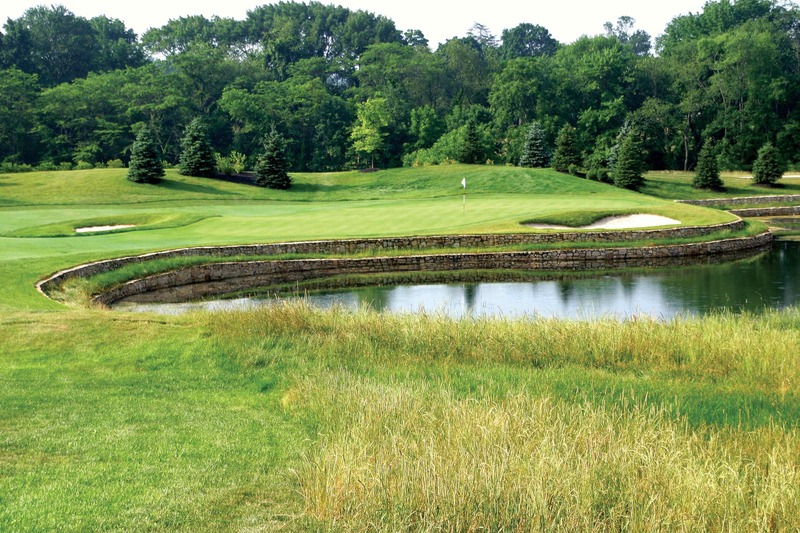 For your reading enjoyment, here’s a tour of the course from GolfClubAtlas.com. Here’s a good magazine story on the Crump Cup. Photos from last year’s Crump Cup are under Photos on the MyPhillyGolf Home page. The biggest upset of the day at the U.S. Amateur involved a local. Amory Davis, from Chadds Ford, a senior at the University of Virginia, pulled off a 3 & 1 victory over Jeff Wilson, the stroke-play medalist and No. 1 seed. Wilson, 47, a reinstated amateur who is now a car dealer in California, earned his No. 1 seed the old fashioned way: He shot a 62 on the first of two days of stroke-play qualifying. Davis earned his spot another old-fashioned way: He arose early Wednesday morning to be one of 16 players vying for six final match play spots. Having earned the last spot, Davis was plugged into the line for sacrificial victims in the match play bracket, facing the No. 1 seed. But the match didn’t work out as expected. Davis stunned the favorite, standing at the equivalent of 4-under par through 17 holes when he closed out Wilson with his sixth birdie of the day. Wilson’s defeat immediately raised questions about the "medalist jinx." But Davis shook off the suggestion, citing his own hot hand as the deciding factor. "Jeff played awesome," said Davis. "If he had run into somebody who played pretty good golf today, he would have smoked him. But, I didn’t play pretty good golf." Like so many young golfers these days, Davis is a near-novice at match play. "I haven’t played play match play since high school, my sophomore year in high school since I was 15 years," he said. In today’s Round 2 match, Davis faces Brad Benjamin, 23, from Rockford, Ill., the 2009 U.S. Amateur Publinks champion. The good news from the U.S. Amateur is that one member of the Philadelphia-area contingent, Amory Davis, from Chadds Ford, made it to match play. The bad news is, in his first round match this afternoon, Davis will face Amateur medalist Jeff Wilson, 47, a car dealer from Fairfield, Calif., who shot 62 on Monday. 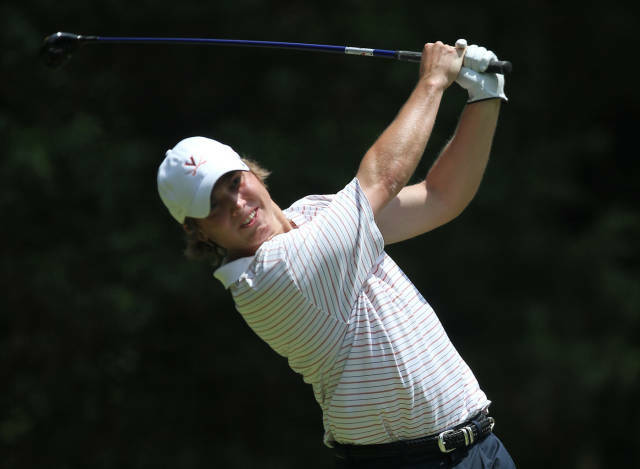 Davis, a senior at the University of Virginia, won his berth into match play Wednesday morning, as one of 16 players in a playoff for six spots. Their match is scheduled to begin at 2:10 p.m. West Coast time. In the locals watch of Philadelphia-area golfers in the U.S. Amateur, after the first of two days of stroke-play qualifying, two players – Amory Davis from Chadds Ford and Brian Belden from Emmaus – are in good position to be among the low 64 who advance to match play. Davis, a senior at the University of Virginia, is the low local, having shot 2-under 70 on The Home Course, tying him for 11th.. Today, he’ll play Chambers Bay, which will host the match play portion of the Amateur. Belden, a senior at the University of Kentucky, is tied for 24th after shooting even par 72. He also plays Chambers Bay today. 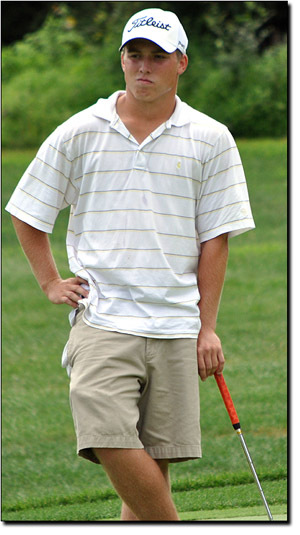 Michael Brown, 37, from Cheltenham, winner of the 2010 Philadelphia Open, shot 3-over 75 and his tied for 97th, along with Brandon Detweiler, from Akron, Pa., a senior at N.C. State, who was medalist at local qualifying for the Amateur. 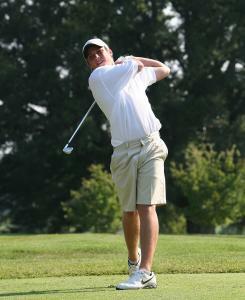 Robert Savarese, from Lafayette Hill, shot 4-over 76 and is tied for 123rd. Marc Mandel, from Conshohocken, shot 6-over 77 at Chambers Bay, leaving him tied for 164th.